Even before Matthew Kershaw officially took over as the new Chief Executive of Brighton and Sussex University Hospitals NHS Trust on 1 April, he had announced £30m cuts to local hospital services covering Brighton hospitals and the Princess Royal in Haywards Heath. These include A&E services despite recent reports where nurses spoke of the “worst working week of their lives” as overcrowding and understaffing at RSCH meant they could no longer properly care for patients and feared patients dying. The GMB trades union is backing a major campaign against these cuts together with many local groups. Members of the GMB and other trades unions, Defend the NHS, Brighton & Hove Women Against Cuts, Keep Our NHS Public, the Labour Party, other campaigners and local NHS supporters will gather at 11am outside the main entrance to the Royal Sussex County Hospital, Eastern Road, Brighton, East Sussex BN2 5BE before marching to Victoria Gardens in Grand Parade, Brighton for a rally starting at 12.30pm. Speakers at the rally will include Labour peer Steve Bassam, Caroline Lucas MP, Mark Steel (comedian), Paul Maloney (GMB), Steve Guy (Defend the NHS) and other health trade unions and campaigners. 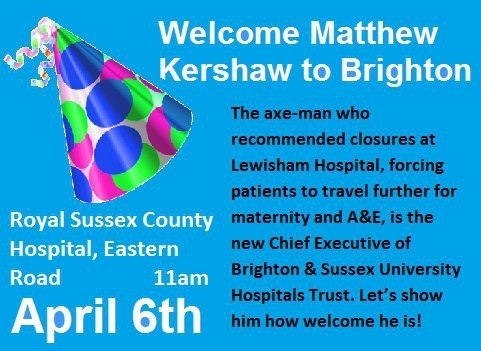 Come along to join in giving Matthew Kershaw the welcome he deserves. Remember the words of Nye Bevan: “The NHS will last as long as there are folk left with the faith to fight for it” Now is the time to fight.